Discussions of the master's craft calls to mind the question, should a dummy look like a puppet or should it look like a real person. Consider these two pictures. The first is of Dexter, my main character. I downloaded the other picture from a current ebay auction only because its the only such figure I've seen from Dexter's generation. These two figures are unique woodcarved examples of Tim Selberg's early work. Dexter was carved in 1987; the little girl was carved in 1990. Both are exquisite carvings with precision mechanics and realistic features. I can't imagine two nicer ventriloquist figures. I have heard Selberg's work criticized because his figures are too realistic. But what's wrong with that? I perform regularly with Dexter. 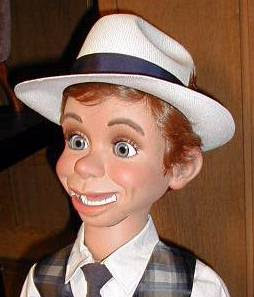 No one from an audience has ever complained that he doesn't look like a puppet. Now consider this lady, my own Aunt Sally. 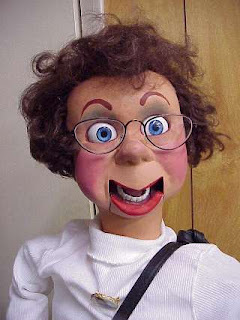 Aunt Sally looks like a puppet. She does not look like a real person. (Well, actually, she does remind me of a lady who works at the veterinarian's.) She's not exquisitely carved, her eyes are not realistic, her hair is a Halloween costume wig, her eyebrows are painted on. Her teeth are sculpted, but don't look real. Her ears, if you could see them, are only suggestions of ears, Marshall-style. No eyelashes, either. 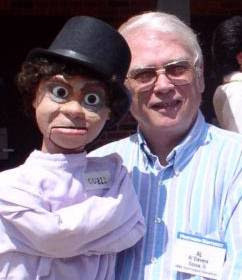 Aunt Sally is a traditional ventriloquist dummy, and I perform with her regularly. 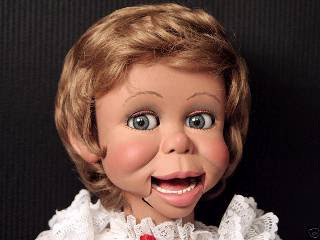 But no one from an audience has ever complained that she looks too much like a puppet. Finally, look at this guy, the one in the hat. That's Renfield in his strait jacket. I'm not sure what he looks like.